In the dead of winter with snow and sleet everywhere, what could be cozier than an intimate bridal shower tea party with close family and friends? It’s just the thing to calm those pre-wedding jitters. Bring to life a nostalgic theme setting inspired by a quaint English cottage. Set out a “proper” English tea service with your own personal (and practical) flair—from the shower invitations, to the table decor, to the favors, food, and drinks. Then, come the party, simply relax and enjoy the company, while sipping a warm cup of tea. Here are some of our own ideas to help you plan a wonderful bridal shower, English tea party style. 1) A palette of pastel hues, with accents of silver and gold, sets the tone of refined elegance for your tea party. 2) A sweet posy of pink roses makes a perfect place card holder for this setting; then goes home with each guest as a thank-you favor. 3) Dainty lace purses holding sweet treats are another lovely favor idea. 4) The star of the party—aromatic tea—is best served in floral-patterned porcelain cups. 5) Don’t forget the sweet treats! Sugar-glazed pastries, tea biscuits, and petite bundt cakes can take the place of traditional English scones. #1 Decorations – When planning the look for your tea party, consider what’s simple and what’s available. Start with an appealing palette of soft pink and blue. Add touches of nostalgia with gold-finished wooden trays, floral-patterned china, sterling silver serving platters, and a vintage tea pot. Your family may already have these at home, or they may be precious flea market finds. Don’t worry if they happen to have mismatched patterns. This only adds to the table’s charm. Finally, create double-duty centerpieces that are actually your guest favors grouped at mid-table. They’re so pretty, you won’t need real flowers. With such a warm, inviting setting, your shower is sure to be a success! #2 Invitations – Sending the word out with lovely shower invitations doesn’t have to be costly. Simply add a whimsical touch to set the tone immediately. Using a pattern from the web or a clipart cutout, create invitations in the shape of little teapots. As a cover flap for each invite, cut out the same shape on vellum paper, punch two tiny holes at the top of each pair of cutouts, insert a length of pink satin ribbon, and tie it in a pretty bow. Option: Instead of following the teapot shape, you may cut around it in a square or oval using special scalloped scissors from Fiskars® for a decorative look. #3 Favors – Remember the double-duty centerpieces we mentioned? These could be assembled from individual flowerpots of fabric roses—a perfect match for the English cottage theme. 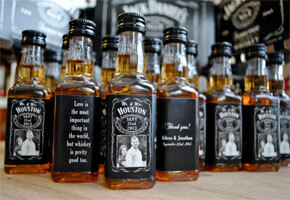 Then, after the tea party, guests take them home as decorative gifts. If you prefer to give edible favors, bake some scrumptious tea cookies and present them in dainty purse-shaped favor bags. 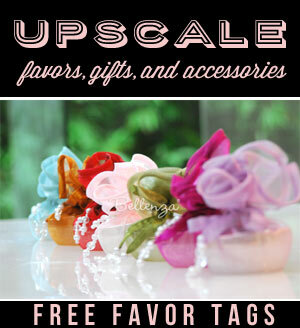 Just add personalized tags with a thoughtful message and your favors are ready! #4 Food – This is an English-inspired tea party after all. So, you may do as the English do, or you can serve whatever suits your fancy! Bite-size sandwiches can be filled with dilled shrimp and cucumber, while mini croissants can have egg, tuna, or chicken salad filling. For the sweet side, offer madeleines, lemon bars, and shortbread cookies alongside mini bundt cakes, peach tarts, and mini scones. Be sure to include pats of butter and an assortment of jams and spreads. Just make the presentation extra special with tiered serving stands or platters atop antique-style urns. Dainty porcelain plates lined with pretty doilies would also suffice. 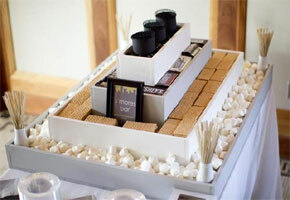 #5 Drinks – Set out a variety of teas for your guests to choose from, ranging from Earl Grey to Ceylon to Jasmine. Provide sugar and cream, as well as small jars of honey and slices of lemon as nice accompaniments. And to suit all tastes, you may have a pot each of freshly brewed coffee and rich hot chocolate on hand, too. For my bridal shower, my mother is planning a tea party. Do you think it’s okay NOT to have a sit-down style arrangement? I mean for budget reasons we are thinking of having the food spread out on a table and guests can serve themselves. We will then eat in our living room with some extra seats provided for guests. I’m just wondering…Thank you. I think the tea and food ideas are very easy to follow. Plus, I live in a very small town outside of Vermont, so having a tea party for a bridal shower party could not be better at this time of the year. For my sister’s bridal shower, we are doing a Jane Austen themed tea party, since she loves the author’s books. As a way of providing entertainment at the party, we will be showing some movies. And for favors, I’m thinking that a pretty rose pot is a nice memento. You can certainly have a non-traditional tea party without formal place settings. It is especially great when you have a very small guest list and everybody can gather around a coffee table located in a living room or even family room. It also makes for a very cozy atmosphere where guests can enjoy conversation. I am planning a bridal shower tea party. This is a re-newal of their vows. We want this to be a fun party. Date May 1st. Any suggestions as to decorations, favors etc. Food will be light sandwiches, tea, cakes etc. Thank you for stopping by! You’re having a bridal shower party for a renewal of vows ceremony? That’s interesting. Never heard of it before, but that’s truly different. Your decor can consist of a palette that takes its cue from spring so you’re looking at having shades of orange, yellow, and green. Adding red is also a great accent color. Since it will be tea party right around springtime, you can have pretty, white glass pitchers filled with flowers such as tulips in hues of red, orange, and yellow, yellow daffodils, or marigolds. As for the favors, consider giving something practical such as candy sachets filled with some potpourri, homemade cookies using a family recipe, or how about a lovely frame presented with a message commemorating the special event. When it comes to the food, light sandwiches and pastries are definitely a good idea. Think of fillings such as smoked salmon, tuna, or even shrimp. You may want to check out “Afternoon Tea Parties” by Susannah Blake for menu ideas! I am having an afternoon tea party for my younger sister. As kids, we used to love playing tea party with our little tea cup toy set. Now, we are going to have the cake for the shower patterned after this toy set as a surprise for her! I think she will love it! 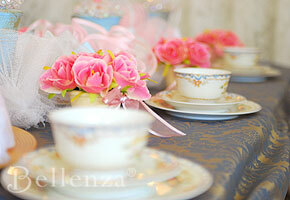 I just love tea parties and for my sister Alice’s bridal shower, we are hosting a mad hatter tea party. Imagine that..her name is also Alice! She’s also a big “Alice in Wonderland” fan so it made sense to do this. The highlight of the party will be the big chair that we plan to have for her at the tea party. We’re decorating it with ribbons and making a pretty sign on the chair.